A kitten napping in a bowl on a stack of books. A wonderful literary gift for a book and cat lover. Especially for a best friend. 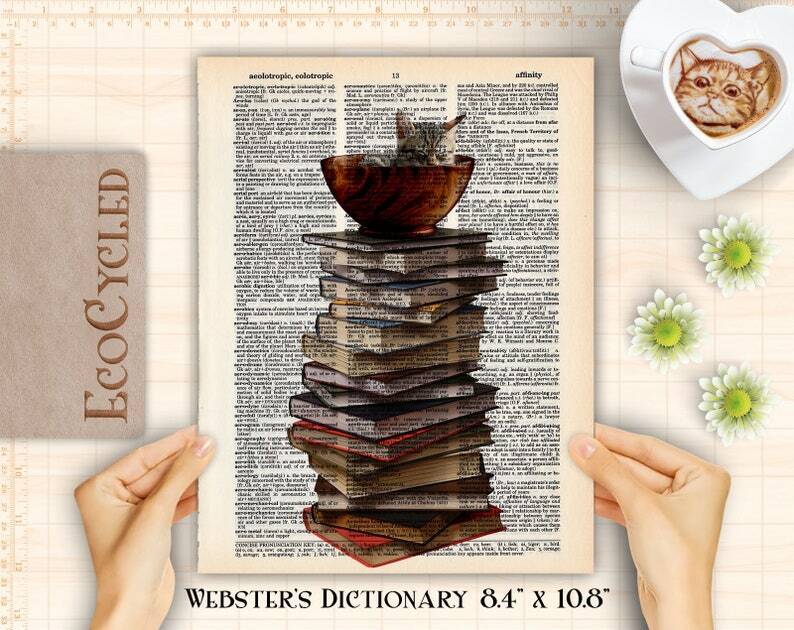 Printed over a lovingly upcycled dictionary art page. A perfect literary gift for a best friend or cat lover for a housewarming or a book nook. We rescue old books and rejuvenate them as clever and unique art just for you. Our book art prints are as smart and unique as you are. Original Art by EcoCycled. NOTE: some books are very old, some are newer, they are all VERY different (size, color, age, wear, etc). See the pics and the links. 📚 TO UPGRADE to one of the other book pages (see below), CHOOSE: 'Going to Upgrade' and then add the appropriate listing of the upgrade to your cart at the same time. (See below to find the links to the upgrade listings). You need BOTH links in your cart at the same time. This listing AND the upgrade listing of your choice below. DO NOT add the bonus print to your cart! Etsy will charge you for it. Copy & paste the FULL Title of the design you want for your free book art print, and on which page, in the Note to EcoCycled in your cart. Please request your free bonus print at the time you place your order. If we have already sent your order to you, it's too late to get the bonus. We'd love to make a custom item for you. Just contact us and we'll come up with something interesting and unique together. There is an additional charge for custom work. Contact us BEFORE you order. If you would like a specific word on a dictionary page, there is a $7.50 fee. Please contact Neece BEFORE you order for more details and to tell her what word(s) you are interested in. We will look to see if we have it. If you would like a specific book page from one of our many books, we can do our best to honor your request. There is an $11 Upgrade fee for selecting an exclusive, one-of-a-kind page. Please contact Neece for more details and to tell her what book page you are interested in. We will look to see if we have it. Hand written gift message inside. Mailing envelope will be decorative. No invoice will be included. Beautiful item!!! My daughter loved it and so do I! Thank you so much! Looks super cute with my Steiff Winnie the Pooh and honey pot. Highly recommend. Loved this saying and print for my college freshman theater major daughter who can always use a little more encouragement. It was printed on the perfect page from The Wizard of Oz selected by Neece. Will take Neece's suggestion of framing in a clear frame so that both sides of the page can be seen. My daughter will love this gift when she comes home in a few weeks. Thank you so much for your creativity!! NOTE: The cardstock and the semigloss photo paper are WHITE and have NO book page behind them. So the design will be printed on the white paper. There will NOT be a book page image behind the design. I want something other than the standard dictionary choices! We love to create custom designs! Please contact Neece BEFORE you order so we can work together to create something unique for you. If you are ordering a design that simply has names and dates added, just add the names and date exactly as you'd like them to be printed in the Note to EcoCycled text box when you check out. There's no need to contact us for these designs. I want a specific page from a book, please! We print on random pages from the book you select when you check out. However, we offer an upgrade to a hand selected page. Please contact us BEFORE you order if you would like to upgrade to a hand selected page. We need to check to see if we have what you are requesting. There is a $7.50 upgrade for a hand selected dictionary page. There is an $11 upgrade for a hand selected, one of a kind book page (non-dictionary). We do not carry or sell frames. 1. Get a clear magnetic acrylic or glass frame that is a bit larger than the page. The page will then 'float" in the frame. It looks great, and then you can also see the back of the page. 2. Get a large sheet of colored craft paper, available from craft stores. They come in many styles and colors to complement the printed page. Place behind the book page to fill in the extra space in the frame. This lets you see the whole page where it was removed from the book, or you can trim the rough edge if you'd like. Please hang the prints where they won't be in direct sunlight. We offer wholesale to brick and mortar retail shops. Please contact Neece for more information. This is for SHIPPING times. None of these dates are guaranteed by the post office, even the priority. The only one that is guaranteed is Priority Express, which is 1-3 days depending on where you are located. For Names and Date customizations, the above times are good. If you would like any other customization, please order EARLY (ASAP) as it takes time and it gets very busy. As it gets closer to the holidays, the time it will take me to create a custom design gets longer.